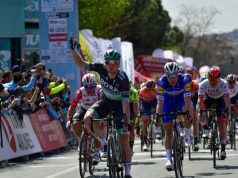 Sam Bennett’s momentous season was crowned on Saturday night as the Bora-Hansgrohe sprinter landed International Performance of the Year at the Cycling Ireland Annual Awards. 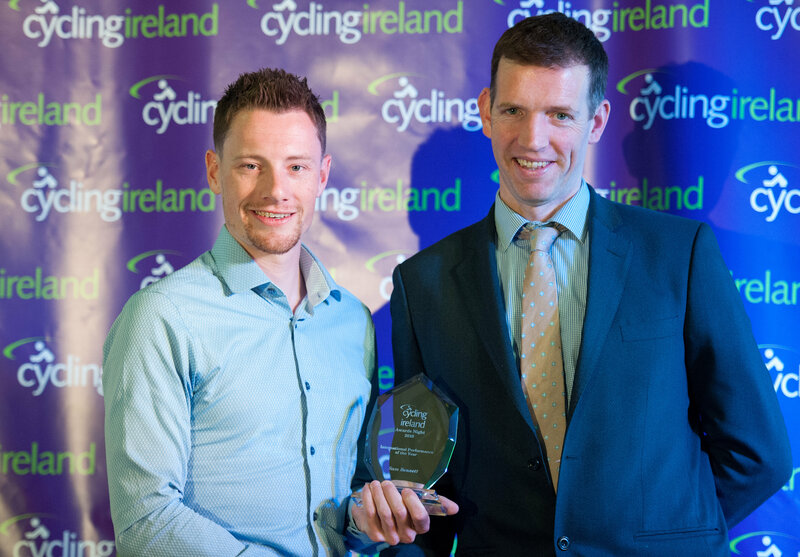 The 28-year-old from Carrick-On-Suir was among 14 award winners as the best Irish performances in cycling, both domestically and internationally, across road, off-road, track, and leisure were celebrated at the Crowne Plaza Hotel, Blanchardstown, Dublin. Bennett first took to the stage to collect one of six Special Achievement awards, given to members of High Performance teams that have excelled in 2018, then moments later was revealed as winner of the night’s final award: International Performance of the Year. 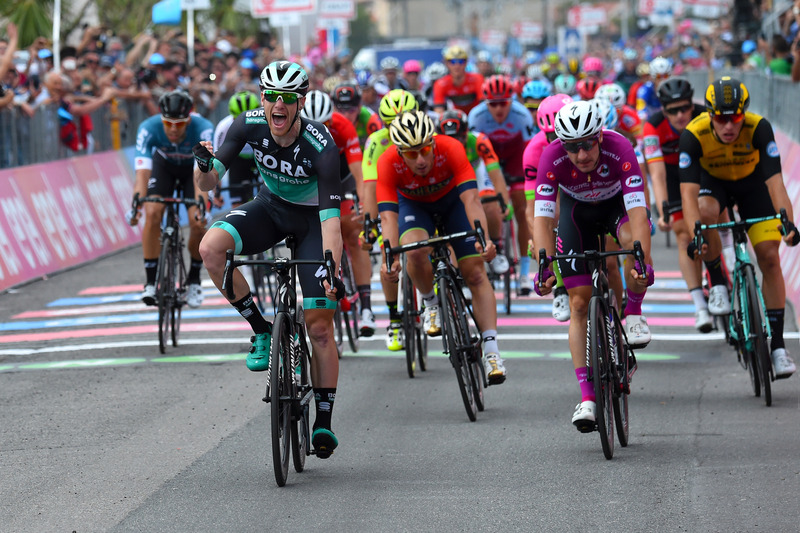 In May, Bennett became the first Irish cyclist to win a stage of the Giro d’Italia in 31 years. It was his first Grand Tour stage win and he would go on to win two more sprint stages, bettering Stephen Roche’s Irish record of two stage wins at the same Giro. Speaking on Saturday night, he said: “Winning these awards tonight is an acknowledgement of the results I have been trying to achieve for 10 years. I moved away from home when I was 18 years old, and there have been times since then when I didn’t think I could do it. 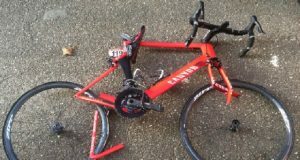 He added: “I came through the grass roots of Irish cycling, starting with Bobby Power in Carrick Wheelers. He had a mountain bike league at that time. It was only a kiddies league, but that’s how I got started and so many before and after me. 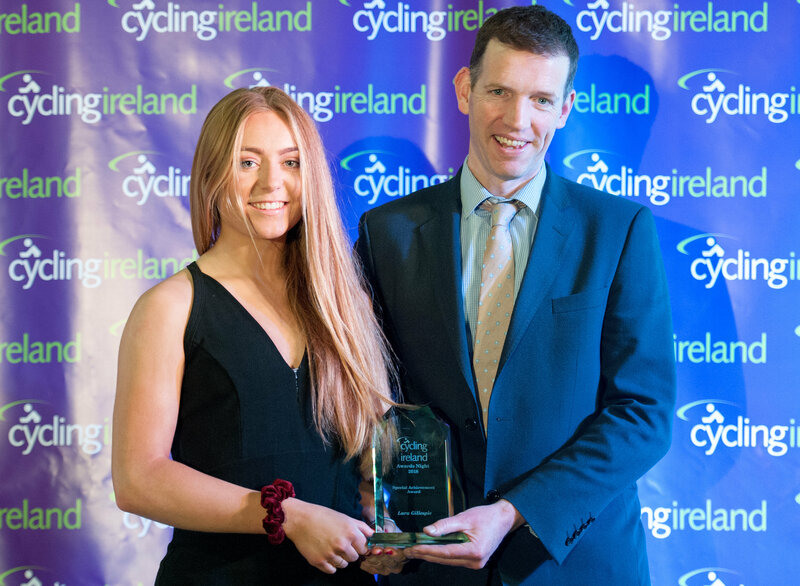 Matching Bennett for wins on the night was 17-year-old trail-blazer Lara Gillespie, crowned the Cycling Ireland Female Rider of the Year, and taking a High Performance Special Achievement award. In August, Gillespie took Gold at the European Junior Track Cycling Championships in the Points Race, just days after earning silver with a new Irish record in the individual pursuit, adding those international successes to the 11 national titles she already holds – across track, road and cyclocross. Gillespie said: “I’m just enjoying all the disciplines at the moment. 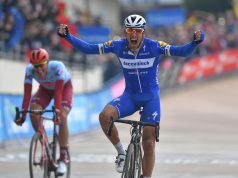 Cyclocross worlds was crazy, I’d no idea what to expect, and track worlds were the same. The Wicklow native was also part of a third award as her Scott-Orwell Wheelers took home Club of the Year, and the club itself was celebrating not only its overall win and Gillespie’s trophies, but also a win in Volunteer of the Year, as member Genevieve Sheridan took the title. 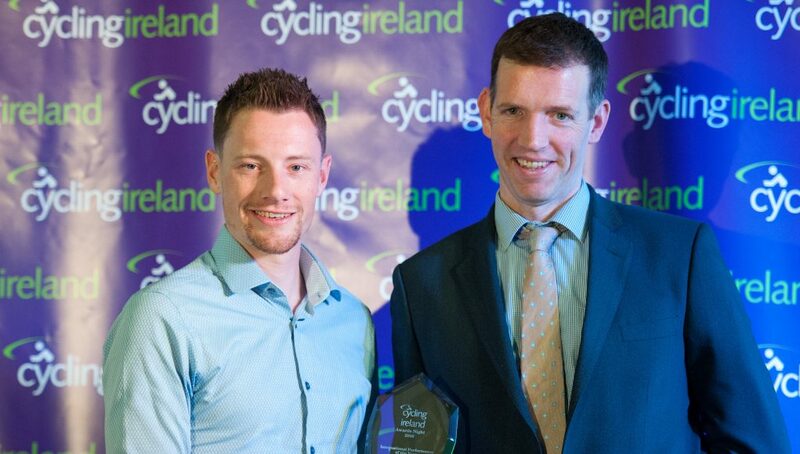 Cycling Ireland Male Rider of the Year went to National Road Racing Champion Conor Dunne. 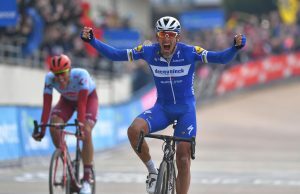 The 26-year-old, a giant in the peloton at 6’ 8”, has put his professional career back on track recently by signing to race for the Israel Cycling Academy in 2019. Other Special Achievement awards were presented to mountain bike riders Leah Maunsell, ranked sixth in the U21 Global Enduro World Series, and Greg Callaghan, who gained his third international at the Enduro Winter Trophy win in Italy in February. While in Para-Cycling, double World Champions Katie-George Dunlevy and pilot Eve McCrystal were recognised, as was three-time Masters Mountain Bike World Champion Robin Seymour, and Cycling Ireland’s retiring secretary Jack Watson. 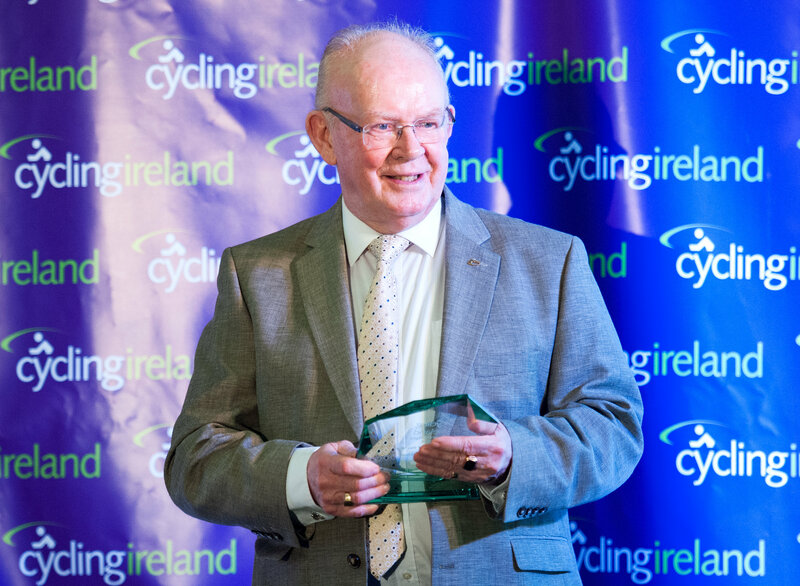 Watson, who received an MBE for his services to cycling last December, was instrumental in the creation of Cycling Ireland and has worked for the sport for more than 50 years, directly taking roles in national administration since 1969. 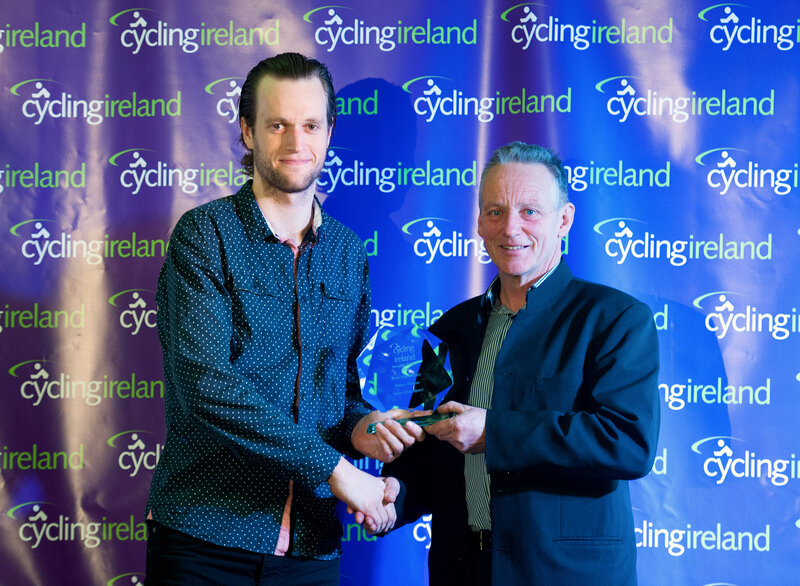 The UCI awarded him the highest cycling award it has in 2003 when he became a recipient of the Gold Merit Award at the UCI Congress in Hamilton in Canada, and 10 years later he was among the first inductees to Cycling Ireland’s new Hall of Fame.